Despite today’s low unemployment rate, workers today face a range of uncertainties and challenges. In the post-World War II era, many workers could expect a stable career at a single company that would assume responsibility for investing in the workers’ skills over time. This stability has now given way to careers consisting of multiple jobs in potentially different occupations and industries. For many, work is becoming more independent, short-term, and project-based. At the same time, new technologies are demonstrating the ability to perform tasks previously done by workers. As these trends continue, workers will need to update their existing skills and acquire new skills throughout their careers. This new environment demands changes to the outdated education model in which Americans could expect the education and skills they obtain when they are young to last their entire career. Updating this model to better serve today’s workers requires a variety of approaches. Employers play a unique and vital role in workforce training, but workers must also be given additional tools to acquire new skills and learning opportunities over the course of their careers. This issue brief proposes the creation of worker-controlled Lifelong Learning and Training Accounts (LLTAs). These accounts would be funded by workers, employers, and government, and could be used by workers to pay for education and training opportunities. The accounts are not designed to be long-term savings vehicles; balance limits and limited investment returns are intended to encourage workers to regularly use their LLTA funds for training throughout their careers. Based on economic modeling conducted by District Economics Group, 23 million Americans would contribute to these accounts to fund training over the next ten years, costing the federal government roughly $25 billion over this same time period. This proposal is designed to provide significant incentives to low-income workers to participate in training, given the financial challenges they face participating in savings-based programs. Consistent with that goal, 79 percent of the cost of the proposal would benefit individuals who make under $30,000. The ability to acquire post-secondary credentials remains critically important in today’s economy. Higher levels of education correspond with lower unemployment rates and higher median earnings (Chart 1). 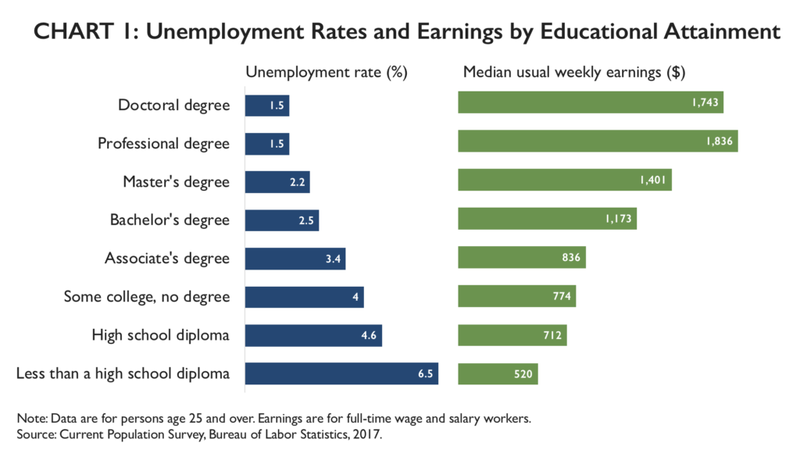 While four-year degrees continue to provide an earnings premium, other types of credentials also provide considerable economic returns. In one study, vocational certificates and associate degrees corresponded to more than 30 percent higher earnings than a high school degree alone. At the same time, there are important differences between racial groups, indicating that higher education is not benefiting students equally. The advance of automation further suggests that additional education will be important as the economy evolves. The McKinsey Global Institute predicts that occupations that currently require a secondary education or less will see a net loss of jobs due to automation, while occupations requiring college degrees will experience job growth. First, new technologies will result in changes to the activities workers are being asked to perform in their existing jobs. A recent McKinsey report estimated that 23 percent of current work activity hours in the U.S. could be automated by 2030, and that in about 60 percent of occupations, at least one third of the constituent activities could be automated. As machines are increasingly capable of doing tasks previously done by humans, workers will be required to take on new and different tasks. Often, this involves machines doing routine tasks that workers had previously done, with workers increasingly relied on to perform activities that require core skills that are difficult to automate, including critical thinking, social skills, management, decision making, planning, and innovation. For example, with the introduction of self-service kiosks, workers who used to work behind a cash register are now expected to be more customer-facing, requiring more social skills and knowledge. Similarly, when Electrolux – the world’s second-largest manufacturer of home appliances –automated its production process, it asked its workers to focus on the creative task of designing and implementing changes to the factory floor and robot layout to maximize efficiency. More broadly, the World Economic Forum estimates that by 2020, more than one third of the core skill sets of most occupations will be skills that are not considered crucial to today’s workforce. At the same time, an increasing number of workers will need technology and digital skills – ranging from basic digital literacy to advanced computer science – in order to interact with new technologies at work. The Brookings Institution created a digitalization index to measure changes in the digital content of 545 occupations covering 90 percent of the workforce; it found that jobs are increasingly requiring digital skills, with the average digitalization index across all occupations rising 57 percent between 2002 and 2016. Similarly, research by Burning Glass Technologies looked at nearly 27 million job postings and found that 80 percent of all middle-skill jobs are digitally intensive, and that these jobs are growing twice as fast as those not requiring digital skills. As technologies like artificial intelligence and machine learning continue to evolve and change the workplace, workers will need not only to acquire new skills, but also to keep them updated over time. Second, automation will result in some jobs being eliminated, requiring workers to switch occupations or industries entirely. The most vulnerable jobs are characterized by repetitive, predictable activities like operating machinery, preparing fast food, and collecting and processing data. The impact of this displacement could be significant; it is estimated that up to 32 percent of workers may need to transition to entirely different occupations by 2030. Some industries that are most susceptible to automation, such as retail, disproportionately employ low-wage workers and provide vital entry-level jobs. Impacted workers will need to retrain for new jobs, which likely would require very different skills from those their current job requires. As technology eliminates some jobs, it will also create others, and helping workers acquire the skills necessary to take advantage of these opportunities is essential. Each of these challenges highlights the need to develop better systems to encourage lifelong learning. Workers must have the ability to update their existing skills and acquire new skills throughout their careers. Unfortunately, the country’s education and training systems are not up to the task. Investment in higher education continues to dwarf the amount spent on training. The federal government currently spends over $180 billion on higher education, but only about $12 billion on training and employment programs per year. While the education system also includes elements of workforce development, especially at the community college level, it was largely designed for younger students pursuing traditional post-secondary degrees rather than for mid-career workers looking to quickly develop new skills at an affordable cost. Government programs, such as Coverdell Accounts and the American Opportunity Tax Credit, also require students to be enrolled in school at least half-time, which is not feasible for many workers. At the same time, educators face major challenges updating their curricula and integrating work-based opportunities to reflect the pace of changing skills needs. Traditionally, companies have played a significant role in helping workers maintain the skills necessary to succeed in the workforce. Unfortunately, based on the data available, employers have also been investing less in worker training: from 1996 to 2008, the percentage of workers receiving employer-sponsored training fell 42 percent and on-the-job training fell 36 percent. In 2011, Accenture surveyed U.S. employees and found that only 21 percent had received any employer-provided formal training in the past five years. Employer-provided tuition assistance has also been falling in recent years, from 66 percent of surveyed businesses offering tuition assistance benefits in 2008 down to 53 percent in 2017. In addition, the employer-provided training that is provided disproportionately benefits the most educated workers. Without intervention, business investment in workers is likely to continue to decline. In a recent Accenture survey of 1,200 CEOs and other top executives, 74 percent said that they plan to use artificial intelligence to automate tasks in their workplace over the next three years. Yet only 3 percent reported planning to significantly increase investments in training over the same time period. The Aspen Institute’s Future of Work Initiative has proposed the creation of a business tax credit, similar to the Research and Development credit, to encourage further business investment in worker training. In addition, an employer-based system is ill-suited for the rising number of workers who are in short-term or project-based work arrangements and lack stable employers willing to train them over the course of their careers. From 2005 to 2015, the percentage of the workforce engaged in alternative work arrangements (including independent contracting and temporary, on-call, and contract-firm work) as their primary source of income rose from 10.7 to 15.8 percent. This increase was spread across industries and accounted for 94 percent of net job growth over that period (see Chart 2). Currently about one third of workers regularly participate in independent work in some capacity, and the number of independent workers is predicted to grow. As work evolves, more of the burden is falling on workers to update their skills throughout their careers. A 2012 Accenture survey found that 68 percent of respondents believed strongly that it was their responsibility to keep their skills up-to-date in their current job, rather than their employer’s. A recent Freelancers Union survey found that 65 percent of independent workers said they were updating their skills to remain competitive in a changing job market, with 55 percent participating in skill-related education in the past month. In contrast, 45 percent of traditional workers reported updating their skills and only 30 percent had recently participated in education or training. To succeed in a rapidly changing economy, workers will need to update and learn new skills over the course of their careers, both to adapt to the evolving skills that will be needed to perform in their jobs and to help them transition to new jobs in the event that their industry or occupation faces significant disruption. And while some workers will be able to rely on their employers to help them acquire new skills, many will not, and will need financial assistance and a portable system to access new education and training opportunities. Based on these trends, policymakers should create tax-advantaged Lifelong Learning and Training Accounts, which workers could use at any time during their careers to pay for education and training. Since these accounts would belong to workers, they would be portable from job to job, and the decision on how to use the accounts would be made by workers, not employers. Individual Contributions: Beginning at the age of 18, an individual would be eligible to contribute up to $2,000 per year into a Lifelong Learning and Training Account. Like 401(k) contributions, these would be made on a pre-tax basis, though this tax preference would not be available to workers with an Adjusted Gross Income (AGI) over $50,000 ($100,000 married filing jointly) or an account balance in excess of $10,000. Earnings would be tax deferred as long as the account balance remained below $10,000. If the account balance exceeded $10,000, earnings on that excess would be taxable. Government Contributions: The government would match individual contributions by providing a direct contribution to these accounts. The rate at which contributions would be matched by the government would decline as income rises, with a larger contribution for low-income workers and a smaller contribution for middle-income workers, a feature modeled after the Saver’s Credit. Contributions by high-income workers would not be eligible for matching contributions from the government. Employer Contributions: In order to reinforce the unique and vital role that employers play in workforce training, employers would be eligible to contribute to the account, up to $2,000 annually. For workers who earn under $50,000 in wages, employer contributions would be excluded from workers’ taxable income. Moreover, workers could receive contributions from multiple employers if they worked for more than one employer at a given time. Similar to individual contributions, employer contributions could be based on a one-year look-back basis. Contribution Restrictions and Balance Limitation: Contributions to the accounts would not be permitted once the account reaches a balance of $10,000, an amount sufficient to pay for the tuition expenses of most two-year community college or training programs. The balance limitation is intended to encourage workers to use these accounts frequently throughout their careers, in contrast to other accounts, such as 401(k) plans, that are designed to be long-term savings accounts. Once the balance has been drawn down, workers could replenish the account up to the overall limit. Account Administration and Investment: The U.S. Department of the Treasury would be responsible for determining the lowest-cost option to administer the accounts. Funds would be required to be held in principal-protected assets, such as Treasury bonds, money market funds, or passbook savings-style investments. Eligible Expenses: Funds from the LLTA could be used to pay for any education and training program that results in the attainment of a recognized postsecondary credential, which includes industry-recognized certificates or certifications and licenses that are approved at the state level. LLTA funds could also be used to pay for any program provided by an eligible education institution as defined in Title IV of the Higher Education Act of 1965 (HEA). Funds could also be used to pay for testing and application fees for industry-recognized credentials. Withdrawal Process: To minimize compliance burdens for the individual account owner and the federal government, individuals would be prohibited from making direct withdrawals. To use the funds for eligible education and training, the individual would need to first enroll in an eligible education or training program. To pay for the program, the individual would provide their account number, which the eligible provider would then use to directly access the funds. The funds would transfer from the account to the provider, simplifying compliance and reducing the incidence of ineligible withdrawals. Denial of Double Benefit: If an individual is using an LLTA to pay for an eligible education and training expense, then no other education tax benefit (e.g. 529’s, American Opportunity Tax Credit, tuition and fees tax deduction) could be used in connection with the payment for those same education and training expenses that year. This treatment is consistent with the current rules around today’s education tax benefits that prevent individuals from using more than one tax benefit. However, non-tax education benefits could be used by individuals using an LLTA, just as they can with other education tax benefits. Non-tax education benefits include Pell grants, scholarships, work study, and other grants. Encouraging LLTA Usage: To encourage workers to use their LLTA accounts, employers should present employees with the option to withhold and deposit a portion of their paycheck into their LLTAs. Taxpayers who are receiving the Earned Income Tax Credit (EITC) should be given the option to deposit the tax credit into their LLTA. Unused Balances: To ensure that these savings are used for training purposes, program rules would not allow unused LLTA balances to be rolled over tax-free to retirement accounts. If individuals wanted to terminate their account, they would be required to include the unused balance in ordinary income at this point. However, unused balances could be rolled over into ABLE accounts, which are tax-advantaged savings accounts for individuals with disabilities. Modeling: According to economic modeling conducted by District Economics Group, this proposal would result in 23 million workers contributing to LLTA accounts over the next ten years. The specific subsidy design makes the proposal highly targeted to lower-income individuals: in fact, individuals who make under $30,000 account for 79 percent of the program’s overall cost. The cost of the proposal is estimated to be $25 billion over ten years. Retraining mid-career workers. Finding the time and resources to seek new training opportunities in the middle of a career is a major challenge and one that the country’s current education and training system is not well-designed to help facilitate. LLTAs could help address this challenge, in part by encouraging continuous skill building rather than waiting until it is necessary to make a mid-career transition. Improving unemployed workers’ ability to find new jobs. Job loss can be traumatic, especially when it comes in the context of a wave of outsourcing or automation that affects an entire industry. Lifelong Learning and Training Accounts could give laid-off workers additional resources to use during periods of unemployment to accumulate new skills, better equipping them to find new jobs. More flexibility to shift jobs or careers. Currently, workers’ career paths are partially dependent on the training they receive from their employers. But employers are generally only willing to train workers for the jobs they currently have. This creates a lock-in effect, making it difficult for workers to transition to different occupations or industries. Providing workers with an additional tool to obtain the skills necessary to move between occupations and industries will help workers find jobs that better leverage their interests and strengths. Less reliance on the safety net. About a quarter of wage-earners receive benefits from one or more social safety net programs. As the LLTA helps more workers upskill and reskill, their wages will likely rise, lessening their reliance on these programs. For example, a $1 per hour increase in wages for the bottom 40 percent of workers would reduce the participation rate in public assistance programs by 2.5 percentage points, and public expenditures would fall by $7.3 billion annually. These accounts should also be integrated into the public workforce development system. Career counselors at the more than 2,500 American Job Centers across the country should be trained to advise workers on how best to use their Lifelong Learning and Training Accounts. Unfortunately, this system is underfunded. For example, state grants – which form the core of the WIOA funding system – have been cut by over 40 percent since 2001. The WIOA system should be adequately funded so that the workforce development system has the resources it needs to guide and train workers who use LLTAs. The modeling of this proposal estimates the cost of the account subsidies, but to maximize the utilization of these accounts, additional funding would be needed for administration and marketing. Policymakers should simultaneously explore approaches to ensure that businesses maintain and expand their own training investments in their workers. One option is the creation of the Worker Training Tax Credit as proposed by the Aspen Institute’s Future of Work Initiative in May 2017, which has inspired bills in both the House and Senate. Policymakers should improve data collection and analysis of education and training program outcomes to better determine the effectiveness of these programs. The resulting information should be accessible so that workers and career counselors can make informed enrollment decisions. Policymakers should consider reforming the accreditation system to make it easier for non-traditional education programs to become accredited, potentially expanding the universe of LLTA-eligible training programs. Tuition is one of many obstacles to being able to obtain additional training. Many workers have full-time jobs and family responsibilities. These responsibilities make it difficult to find time to pursue additional education or take a training course. A comprehensive approach to lifelong learning could include policies that address these challenges, such as child care assistance and better coverage for long-term care. In addition, employers should explore allowing workers to pursue training paid for with LLTA funds during work hours. In order to partially offset the cost of the proposal, policymakers should consider eliminating the Lifetime Learning Credit as it would be somewhat duplicative of the LLTA proposal. Other countries are adopting policies that provide lifelong learning and training opportunities to their workers. Singapore recently established “individual learning accounts” for each citizen over the age of 25 to spend on education and training programs from a list of 500 approved providers. The government seeds these accounts with a direct subsidy to individuals of $500, called the SkillsFuture Credit, and even higher subsidies for mid-career professionals. In 2017, over 285,000 Singaporeans benefited from the credit. In 2015, France established individual training accounts that workers can use to pay for 24 hours of training per year over eight years in a wide variety of programs. Businesses fund this benefit with a one-percent tax on payrolls. 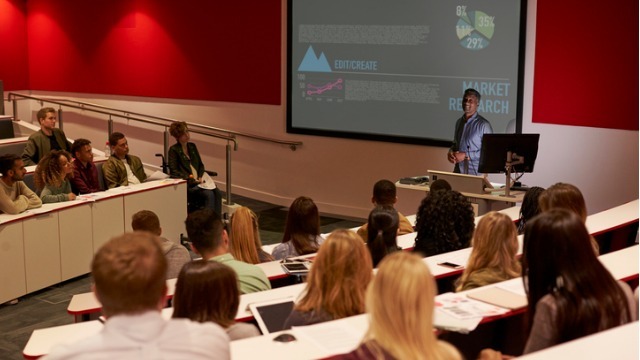 In the United States, the Council for Adult and Experiential Learning (CAEL) has developed and championed Lifelong Learning Account demonstration programs in a handful of states and cities, including Maine, Washington, Chicago, and New York City. The State of Maine launched a Lifelong Learning Accounts program in 2005 that was coordinated by its Department of Labor. The program used its existing Career Center staff and offices to do outreach to employers and workers. Additional program support was provided by the Maine Centers for Women, Work and Community, which assisted workers with their education planning. The Lifelong Learning Accounts themselves were established through the state’s existing Section 529 college savings program, known as NextGen, which is administered by the Finance Authority of Maine, and which includes a matching contribution for low- and middle-income workers. In addition, similar legislation has been introduced in a number of other states. This idea has a history of bipartisanship in Washington D.C. In prior Congresses, Sens. Cantwell (D-WA) and Snowe (R-ME), and Reps. Emanuel (D-IL), Ramstad (R-MN), Larson (D-CT), Polis (D-CO), Kilmer (D-WA), Roskam (R-IL), and Paulsen (R-MN) proposed legislation to create tax-advantaged lifelong learning accounts. Helping workers access lifelong learning opportunities should be a public policy priority. Lifelong Learning and Training Accounts could help reverse the decline in the amount of training that workers are receiving. In addition, the proposal could help workers better manage their economic future by incentivizing workers, businesses, and government to co-invest in the development of worker skills over the course of their careers. This publication was made possible in part by a grant from the Peter G. Peterson Foundation. The statements made and views expressed are solely the responsibility of the authors. The authors would like to thank the many experts who reviewed drafts of this issue brief and provided helpful thoughts and insight, including Alan Krueger of Princeton University; Maureen Conway and Ranita Jain of the Aspen Institute Economic Opportunities Program; Mark Iwry of the Brookings Institution and the Wharton School (University of Pennsylvania); Kermit Kaleba of the National Skills Coalition; Amy Sherman of the Council for Adult and Experiential Learning; Molly Elgin-Cossart of the Markle Foundation; Matt Sigelman of Burning Glass Technologies; and Scott Cheney of Credential Engine. Although they have reviewed the brief, neither they nor their organizations necessarily endorse its findings or conclusions. Hunt Lambert, Dean of Harvard’s Division of Continuing Education and University Extension, estimates that a college graduate today should expect to have 30 different jobs and three separate careers over their 60-year working lives. Future U Podcast. 2018. “Episode 13: Innovation in Continuing Education: The 60-Year Curriculum.” May 15. https://futureupodcast.wordpress.com/2018/05/15/episode-13-maintaining-academic-rigor-in-open-enrollment-courses/. Backes, Benjamin, Harry J. Holzer, Erin Dunlop Velez. 2014. “Is It Worth It? Postsecondary Education and Labor Market Outcomes for the Disadvantaged.” IZA Discussion Paper 8474, Institute for the Study of Labor. September. https://www.iza.org/de/publications/dp/8474/is-it-worth-it-postsecondary-education-and-labor-market-outcomes-for-the-disadvantaged. Meschede, Tatjana, Joanna Taylor, Alexis Mann, and Thomas Shapiro. 2017. “’Family Achievements?’: How a College Degree Accumulates Wealth for Whites and Not For Blacks.” Federal Reserve Bank of St. Louis Review 99(1): 121-37. https://research.stlouisfed.org/publications/review/2017/02/15/family-achievements-how-a-college-degree-accumulates-wealth-for-whites-and-not-for-blacks/. McKinsey’s analysis found that the technical automation potential for occupations requiring less than a high school diploma is 55 percent, whereas for those with a college degree, that potential is far lower, at just 22 percent. Occupations requiring some high school or work experience have an automation potential of 52 percent while those with some post-secondary education have a 44 percent automation potential. See Exhibit 4, page 30. Manyika, James, Susan Lund, Michael Chui, Jacques Bughin, Jonathan Woetzel, Parul Batra, Ryan Ko, and Saurabh Sanghvi. 2017. “Jobs Lost, Jobs Gained: Workforce Transitions in a Time of Automation.” McKinsey Global Institute. December. https://www.mckinsey.com/global-themes/future-of-organizations-and-work/what-the-future-of-work-will-mean-for-jobs-skills-and-wages. “Data analyzed by the Federal Reserve Bank of St. Louis confirm that in the United States employment in non- routine cognitive and non-routine manual jobs has grown steadily since the 1980s, whereas employment in routine jobs of all kinds has been flat.” Muro, Mark, Sifan Liu, Jacob Whiton, and Siddharth Kulkarni. 2017. “Digitalization and the American workforce.” Brookings Institution. November. https://www.brookings.edu/research/digitalization-and-the-american-workforce/. D’Innocenzio, Anne. 2018. “Retail workers’ jobs are transforming as shoppers’ habits change.” Associated Press, Chicago Tribune. January 8. http://www.chicagotribune.com/business/ct-biz-retail-workers-tech-shoppers-habits-20180108-story.html. Wilkes, William. 2018. “How the World’s Biggest Companies Are Fine-Tuning the Robot Revolution.” Wall Street Journal. May 14. https://www.wsj.com/articles/how-the-worlds-biggest-companies-are-fine-tuning-the-robot-revolution-1526307839. Burning Glass defines middle-skill jobs as those that pay a living wage and require some postsecondary education but not a four-year degree. These jobs comprise 46 percent of labor demand. Burning Glass Technologies and Capital One. 2017. “The Digital Edge: Middle-Skill Workers and Careers.” September. https://www.burning-glass.com/wp-content/uploads/Digital_Edge_report_2017_final.pdf. Fitzpayne, Alastair, Ethan Pollack, and Hilary Greenberg. 2017. “Industry at a Glance: The Future of Retail.” Aspen Institute Future of Work Initiative. November. 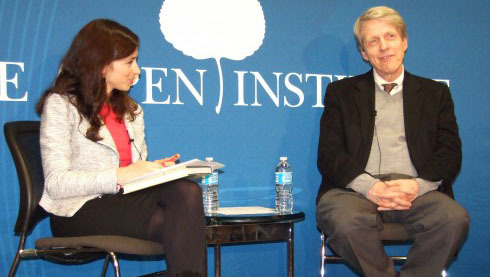 https://www.aspeninstitute.org/blog-posts/industry-at-a-glance-the-future-of-retail/. As an example of technology’s ability to create jobs, the Brookings report on digitization notes that the rise of the digital economy has created hundreds of new occupations ranging from solution architect and cloud services specialist to app developer and social media manager. In addition, economists Acemoglu and Restepo (2016) found that about half of all job growth from 1980 to 2007 came from the creation and expansion of new types of jobs. Acemoglu, Daron, and Pascual Restrepo. 2016. “The Race Between Machine and Man: Implications of Technology for Growth, Factor Shares and Employment.” Working Paper 22252, National Bureau of Economic Research. May 2016, Revised June 2017. http://www.nber.org/papers/w22252.pdf. For federal higher education spending, see Dynarski 2016: Dynarski, Susan, and Judith Scott-Clayton. 2016. “Tax Benefits for College Attendance.” Working Paper 22127, National Bureau of Economic Research. March. http://www.nber.org/papers/w22127.pdf. For federal training and employment spending, see: Government Accountability Office. 2011. “Multiple Employment and Training Programs: Providing Information on Colocating Services and Consolidating Administrative Structures Could Promote Efficiencies.” September. https://www.gao.gov/assets/320/314551.pdf. Note that the Dynarski figure is from 2013 and GAO’s estimate is from 2010. This discrepancy likely understates the difference between higher education funding and training: assuming that GAO’s universe of training expenditures followed the same decline as OMB’s training and employment 504 subfunction (14 percent decline between 2010 and 2013), then 2013 federal training spending would be $10 billion, not $12 billion. Anthony P. Carnevale, research professor and director of the Georgetown University Center on Education and the Workforce notes, “The skill requirements in jobs have increased remarkably in their depth and breadth. The pace of change is outrunning the ability of educators to provide those skills and to qualify people for entry-level jobs.” Gonser, Sarah. 2017. “Without changes in education, the future of work will leave more people behind.” The Hechinger Report. October 31. http://hechingerreport.org/without-changes-education-future-work-will-leave-people-behind/. Council of Economic Advisers. 2015. “Economic Report of the President.” February. https://obamawhitehouse.archives.gov/sites/default/files/docs/cea_2015_erp_complete.pdf. Smith, David, Diego S. De León, Breck Marshall, and Susan M. Cantrell. 2012. “Solving the Skills Paradox: Seven Ways to Close Your Critical Skills Gaps.” Accenture. http://www.youtheconomicopportunities.org/sites/default/files/uploads/resource/Accenture-Solving-the-Skills-Paradox.pdf. Society for Human Resource Management. 2012. “2012 Employee Benefits: The Employee Benefits Landscape in a Recovering Economy.” https://www.shrm.org/hr-today/trends-and-forecasting/research-and-surveys/documents/2012_empbenefits_report.pdf. Society for Human Resource Management. 2017. “2017 Employee Benefits: Remaining Competitive in a Challenging Talent Marketplace.” https://www.shrm.org/hr-today/trends-and-forecasting/research-and-surveys/Documents/2017%20Employee%20Benefits%20Report.pdf. Waddoups, C. Jeffrey. 2015. “Did Employers in the United States Back Away from Skills Training during the Early 2000s?” ILR Review 69(2): 405-434. https://doi.org/10.1177/0019793915619904. Shook, Ellyn, and Mark Knickrehm. 2018. “Reworking the Revolution.” Accenture. January. https://www.accenture.com/t20180125T024403Z__w__/us-en/_acnmedia/PDF-69/Accenture-Reworking-the-Revolution-Jan-2018.pdf. Fitzpayne, Alastair, and Ethan Pollack. 2017. “Worker Training Tax Credit: Promoting Employer Investments in the Workforce.” Aspen Institute Future of Work Initiative. 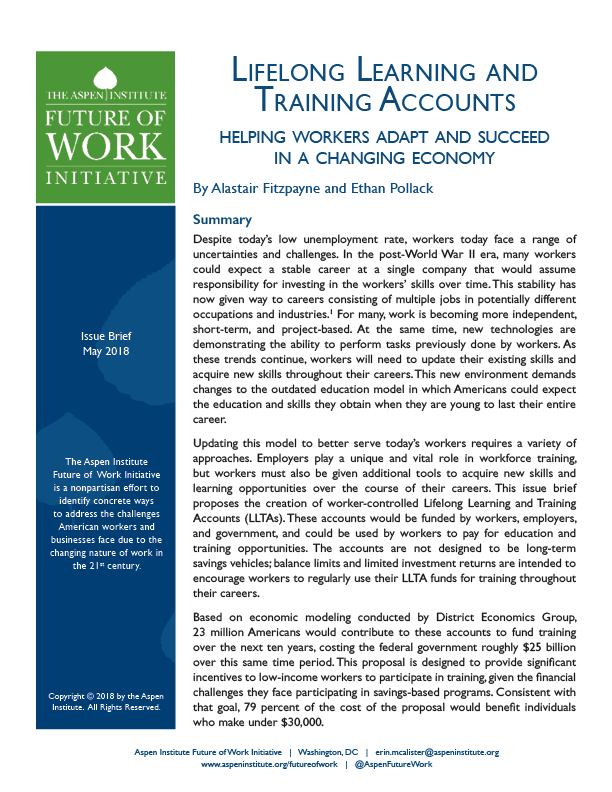 May 12. https://www.aspeninstitute.org/publications/worker-training-tax-credit-promoting-greater-employer-investments-in-the-workforce/. Katz, Lawrence, and Alan Krueger. 2016. 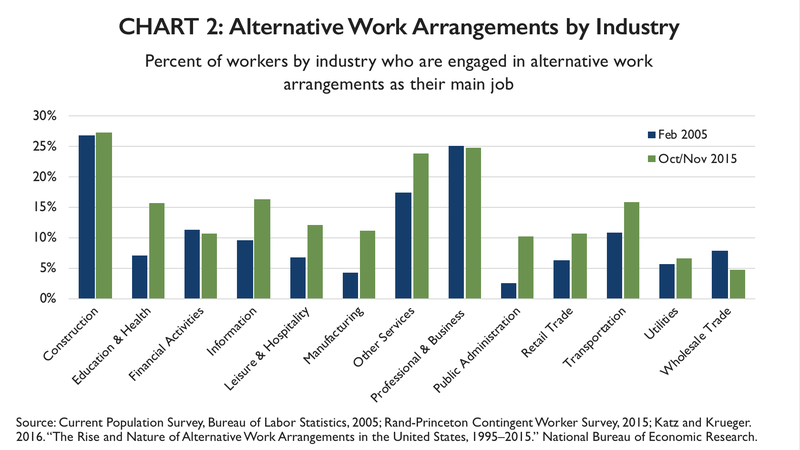 “The Rise and Nature of Alternative Work Arrangements in the United States, 1995–2015.” Working Paper 22667, National Bureau of Economic Research. September. http://www.nber.org/papers/w22667. Steward, Shelly, and Ethan Pollack. 2017. “New Study: 36% of workers engaged in independent work over the last year,” Aspen Institute Future of Work Initiative. October 20. https://www.aspeninstitute.org/blog-posts/new-study-freelancers-upwork/. Carlton, Abigail, Rachel Korberg, Daniel Pike, and Willa Seldon. 2016. “The Freedom, Insecurity, and Future of Independent Work.” Stanford Social Innovation Review. December 16. https://ssir.org/articles/entry/the_freedom_insecurity_and_future_of_independent_work. Accenture. 2011. “Accenture Study Finds U.S. Workers Under Pressure to Improve Skills, But Need More Support from Employers.” November 16. https://newsroom.accenture.com/news/accenture-study-finds-us-workers-under-pressure-to-improve-skills-but-need-more-support-from-employers.htm. Upwork, Freelancers Union, and Edelman Intelligence. 2017. “Freelancing in America: 2017.” September. https://www.upwork.com/i/freelancing-in-america/2017/. By contrast, Coverdell accounts can only accept contributions for people under 18 and can only be used until age 30. For this purpose, AGI could be determined on a one-year look-back basis. Similar to the Saver’s Credit, government matching contributions would not be available to taxpayers that are either full-time students or claimed as a dependent on another person’s tax return. Internal Revenue Service. 2017. “Retirement Savings Contributions Credit (Saver’s Credit).” Last modified October 26. https://www.irs.gov/retirement-plans/plan-participant-employee/retirement-savings-contributions-savers-credit. A variety of alternative, short-term training programs – such as General Assembly – offer programs that cost more than $10,000. Policymakers may want to establish a higher balance cap so these types of programs could be fully financed by this type of a proposal. Section 3(52) of Workforce Innovation and Opportunity Act defines a recognized postsecondary credential as consisting of “an industry-recognized certificate or certification, a certificate of completion of an apprenticeship, a license recognized by the State involved or Federal Government, or an associate or baccalaureate degree.” Industry-recognized credentials are largely determined by state governments, workforce boards, and/or industry associations within each state. Legal Information Institute, Cornell Law School. “20 U.S. Code § 1002 – Definition of institution of higher education for purposes of student assistance programs.” https://www.law.cornell.edu/uscode/text/20/1002?qt-us_code_temp_noupdates=0#qt-us_code_temp_noupdates. Policymakers may want to consider an expanded version of eligible expenses that include costs such as living expenses – while these changes would allow more funds to go to non-training expenses, the benefit of additional flexibility might outweigh that concern. These accounts were first authorized in the Achieving a Better Life Experience Act of 2014. Lumina Foundation. 2016. 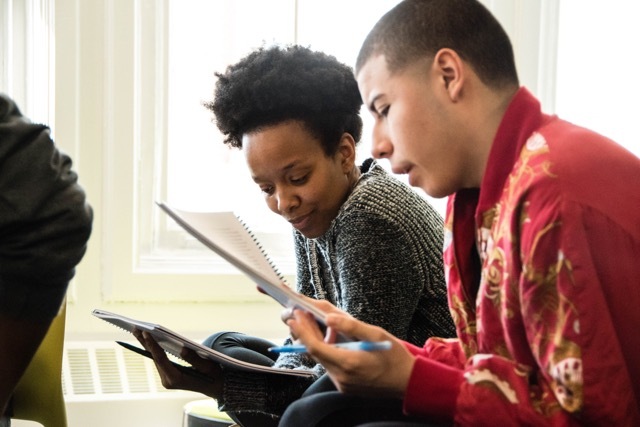 “Talent Investments Pay Off: Cigna Realizes Return on Investment from Tuition Benefits.” April 22. https://www.luminafoundation.org/files/resources/talent-investments-pay-off-cigna-full.pdf. Bartel, Ann. 2002. “Measuring the Employer’s Return on Investments in Training: Evidence from the Literature.” Industrial Relations 39, no. 3 (July 2000): 502-524. https://pdfs.semanticscholar.org/bf58/5b0bf389bb9a7bfbb90b7a3933d76e6b4c8d.pdf. Cooper, David. 2014. “Raising the Federal Minimum Wage to $10.10 Would Save Safety Net Programs Billions and Help Ensure Businesses Are Doing Their Fair Share.” Economic Policy Institute. October 16. https://www.epi.org/publication/safety-net-savings-from-raising-minimum-wage/. The $7.3 billion calculation was made by multiplying the $178 annual change in benefits by the 40.7 million workers in the bottom four deciles (Table 3). Cooper, David. 2016. “Balancing Paychecks and Public Assistance: How Higher Wages Would Strengthen What Government Can Do.” Economic Policy Institute. February 3. https://www.epi.org/publication/wages-and-transfers/. National Skills Coalition. 2017. “America’s Workforce: We Can’t Compete If We Cut.” August 14. https://www.nationalskillscoalition.org/resources/publications/file/Americas-workforce-We-cant-compete-if-we-cut.pdf. The Economist. 2017. “Equipping People to Stay Ahead of Technological Change.” January 14. https://www.economist.com/leaders/2017/01/14/equipping-people-to-stay-ahead-of-technological-change. SkillsFuture Singapore. 2018. “SkillsFuture: 2017 Year in Review.” January 2. https://www.myskillsfuture.sg/content/portal/en/about/about-myskillsfuture/2018-press-releases/2018-year-in-review.html. Eurofound. 2017. “France: Employers Obligation to Provide Skill Development Plans or Training.” Last modified October 27, 2017. https://www.eurofound.europa.eu/observatories/emcc/erm/legislation/france-employers-obligation-to-provide-skill-development-plans-or-training. The Council for Adult and Experiential Learning. 2011. “Lifelong Learning Accounts: Helping to Build a More Competitive Workforce.” https://cdn2.hubspot.net/hubfs/617695/2011_LiLA%20Policy_Overview.pdf. Main, Auta. 2008. “Maine’s Lifelong Learning Accounts: Good News for Workers, Businesses, and the Economy.” State of Maine. https://www1.maine.gov/labor/careerctr/docs/0908_lila_article.pdf. Washington Workforce Training and Education Coordinating Board. “Where can Lifelong Learning Lead You?” State of Washington. http://www.wtb.wa.gov/LifelongLearningAccount.asp. Office of U.S. Senator Maria Cantwell. 2007. “Cantwell Legislation would Create Lifelong Learning Accounts Similar to 401(k)s.” January 10. https://www.cantwell.senate.gov/news/press-releases/cantwell-legislation-would-create-lifelong-learning-accounts-similar-to-401ks. House bill: 110th Congress. “H.R.6036 – Lifelong Learning Accounts Act of 2008.” Introduced May 13, 2008. https://www.congress.gov/bill/110th-congress/house-bill/6036. House bill: 113th Congress. “H.R.1939 – Skills Investment Act of 2013.” Introduced May 9, 2013. https://www.congress.gov/bill/113th-congress/house-bill/1939.